PreCheck is probably the best innovation brought forth by the much maligned TSA. And now, its even easier to know if you qualify before you head to the airport. Airlines have now added information on boarding passes that show if that particular flyer has qualified for PreCheck access for that flight. For those that qualify, PreCheck allows for a much easier, and typically much faster security screening experience. It is similar to the ‘old’ days, before the TSA. Shoes, jackets and belts can remain on, electronics can stay in bag. The only restriction I’ve noticed is that mobile phones must be run through the belt, rather than carried through the walk-through metal detector. I scan my boarding pass at the entrance to the PreCheck lane, get 3 beeps, then put my phone in the bag, put it on the x-ray and walk through the metal detector. It can be done in less than a minute, it is quite awesome. More details on this process from the the TSA website here. View of the PreCheck area in Terminal 1 at O’Hare. Most larger airports in the USA now have dedicated PreCheck lanes. Below is a map from the TSA site showing airports as of May 2013. Certain frequent travelers from Alaska Airlines, American Airlines, Delta Air Lines, United Airlines, US Airways and certain members of CBP’s Trusted Traveler programs, including Global Entry, SENTRI, and NEXUS who are U.S. citizens are eligible to participate. TSA plans to expand TSA Pre✓™ to include additional airlines, as well as airports that participate in a CBP Trusted Traveler program, once operationally ready. In addition, accompanying passengers 12 and younger are allowed through TSA Pre✓™ lanes with eligible passengers. Each airline also has information on how to access the PreCheck lanes at each airport. In some airports, only certain airlines are eligible for PreCheck due to the terminal configuration. For example, There is PreCheck at McCarran airport in Las Vegas, but it is not available at Terminal 3, where the ticket counters are for Alaska and United. In that case, those flyers can still access the PreCheck lanes, but they must clear security in Terminal 1. I am a Trusted Traveler via my NEXUS and Global Entry membership. I think I have received PreCheck at least 90% of the time when flying on eligible itineraries. It might be 100%. I can’t remember being denied. Approval rates aren’t nearly as high for people who only signed up through the airline without Global Entry membership. I only have a few data points, but my wife has yet to get 3 beeps despite being registered for the program with United. Up until this information became available on boarding passes, there were a few options to pre-determine PreCheck eligibility. Scott here at Travel Codex has a detailed summary of how to find this information. I still find myself using this for piece of mind, and the fact that I sometimes cut it too close before flights. The barcodes used are not secure, so a barcode scanner app can find the information. As Scott’s article mentions, you are looking for a 3 preceding the UA UA in the code below. These steps are likely no longer necessary, but I’d be interested if the PreCheck logo was displayed, but access was not granted. Hopefully that wouldn’t happen, but who knows. 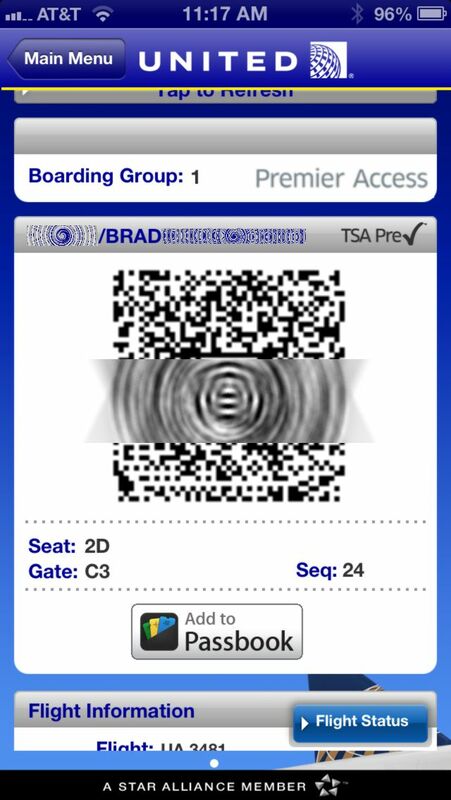 Redacted info pulled from QR code on boarding pass above showing “3 UA” meaning PreCheck approved. The PreCheck logo denoting approval is now shown on both mobile and printed boarding passes. My experience is with United, but I understand that both Delta and US Airways will also have this information included on their boarding passes, which should allow flyers to know which security line to head to. I’ve spent a lot of time talking about my poor experiences on United of late, but this is one area that is a big improvement, making the travel experience much less stressful. If you can get PreCheck, by all means go for it.